West Ham's new striker Andy Carroll is 'gutted' after suffering a hamstring injury on his debut that is likely to keep him out of the start of England's World Cup qualifying campaign. Hammers boss Sam Allardyce secured the loan signing of Liverpool striker Carroll earlier in the week after courting the 23-year-old for most of the transfer window. 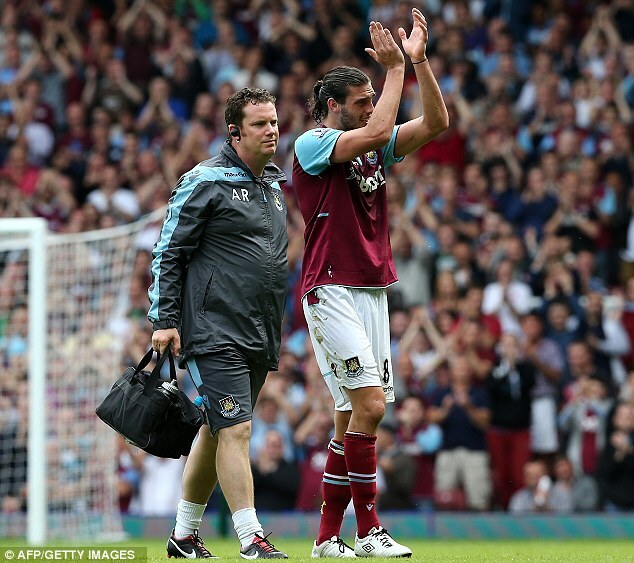 However following an impressive debut in a 3-0 win over Fulham, Carroll was forced off with a hamstring injury which has cast doubt on his inclusion in Roy Hodgson's squad for the back-to-back qualifiers against Moldova and Ukraine. Allardyce reckons it is highly unlikely the Liverpool reject will be fit in time to join up with the national team but believes he will be a mainstay in the future. Skipper Kevin Nolan opened the scoring inside the first minute before goals from Winston Reid and Matt Taylor wrapped up the three points before half-time.